 Pursuing, as he admits an ‘old school’ idea of turning to marathons at the end of his career, the 29 year old Kipchoge made a winning debut, 2.05.30 in Hamburg six months ago. 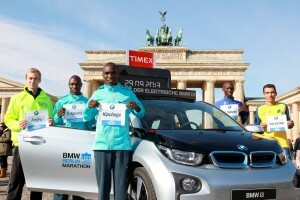 It was a tough race, but if Hamburg was the frying pan, Berlin, where he runs on Sunday, will be the fire. The course may be clement – ‘flat and forgiving,’ as Desiree Davila characterised yesterday – but the opposition is torrid. It would have been more so, had not current world record holder, Patrick Makau had to pull out, injured, a fortnight ago. But Wilson Kipsang, who ran just four seconds shy of Makau’s 2.03.38, when winning in Frankfurt two years ago, leads the fray. The unrelated Geoffrey Kipsang, who finished third in Berlin (2.06.12) last year was also on the top table at today’s (Friday) press conference. And Eliud Kiptanui, who made his own cataclysmic European debut with a 2.05.39 win in Prague 2010 is waiting in the wings. 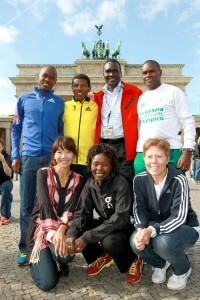 Wilson Kipsang left few doubts that his trip to Berlin had any other objective. “Right from the start, I’ve prepared to run very well here. It’s in my mind to run the world record. Having run 2.03.42, I know it’s possible. I’ve trained to my very best, and if everything goes well with the pacemakers and my colleagues, I think we can do it. It’s a team effort, like in training, even more in a race. The more you have a strong group, the more easy it is”. 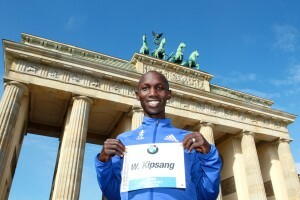 At 20, Geoffrey Kipsang is only a few months older than Kipchoge was when he won his world title in Paris. But after failing to make national cross country and track teams, Geoffrey K, like so many of his young compatriots turned to the road. He has run a superlative 58.54, in winning the prestigious Ras Al Khaimah Half-Marathon in January; but he made light of his comprehensive defeat of his namesake Wilson, in the Bogotá ‘half’ three months ago, saying, “The half-marathon and the marathon are two different things, I’m just looking to run better than last year. I’ve prepared well, but my real focus is the beat my best”.